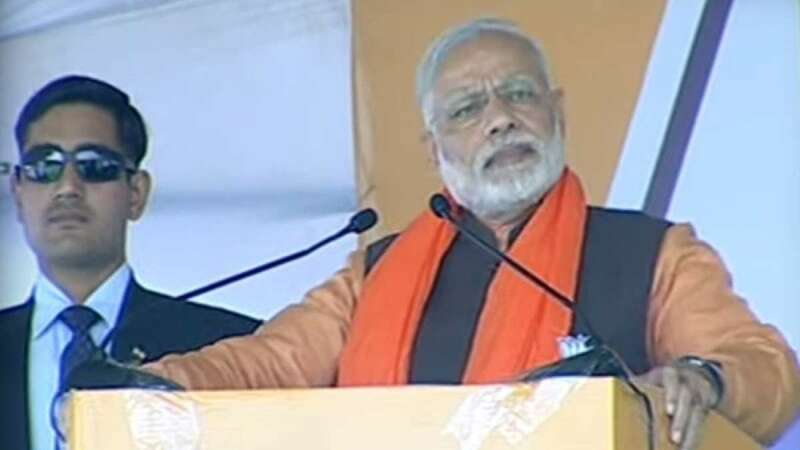 Faridkot : Prime Minister Narendra Modi on Sunday addressed an election rally in Faridkot, Punjab. Urging people of the state to elect a BJP-SAD alliance Government in the upcoming elections, Shri Modi said that Punjab needed a Government that was committed to welfare of its people and had the vision of development. 1. Punjab shares its border with Pakistan. For security, the state needs a Govt committed to safety & security of people in the State. 2. Few people are speaking bad words about Badal Sahab. This is not acceptable for such a tall leader. 3. Those who are not honest, we cannot expect them to speak well about Badal Sahab. How can they think of welfare of people in Punjab. 4. There can be differences in our political thinking but protecting democratic rights must be at the core. Dictatorship is not tolerable. 5. Congress labelled youth of state as terrorists. Few others called them drug addicts. How can that be accepted. 6. What matters most for Badal Sahab is welfare of Punjab, its farmers & the people. 7. We want our farmers to prosper. We want their incomes to double and hence have initiated several measures. 8. We brought the Fasal Bima Yojana. Our Govt's initiatives are formulated keeping welfare of farmers at its centre. 9. I urge people in Punjab to elect a Govt that is committed to welfare of people of the state.